This was the one total eclipse I wasn't supposed to see. I'd agreed to help to sail a luxury yacht from Australia to Europe between May and August, 2001. It would have been a fantastic expedition. We were due to set sail from Darwin in April, 2001 sailing via Cocos and Christmas Islands to the Chagos archipelago. At the time of the eclipse I should have been snorkeling around coral atolls, fishing and windsurfing for a month or more in the Chagos islands before sailing on to Madagascar, Seychelles and possibly the Red Sea and Mediterranean depending on transit times. 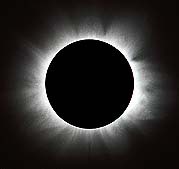 On June 21st, I should have observed a modest 5% or 10% partial eclipse from the central-west part of the Indian Ocean. The owner of the yacht suddenly postponed the trip for at least 12 months due to circumstances beyond his control just weeks prior to our planned date of departure. I was free once again. I quickly activated plan B. I booked an air ticket to Zambia. All flights were full from June 11th to June 21st so I had to fly to Zambia some ten days before the eclipse. I booked some accommodation and arranged to stay 4 days at a small village called Kapini during the week before the eclipse. I completed construction of a small portable equatorial mounting of my own design on the 9th June. I only just completed the project hours before departure. The mounting was transported to Africa in parts having never been assembled or tested. 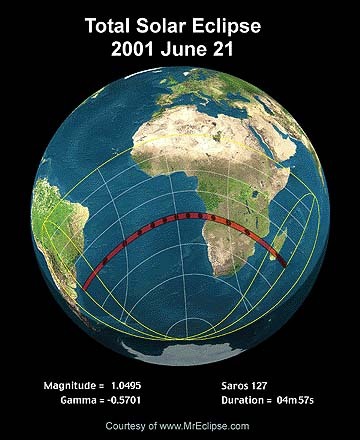 One week before departure, I arranged to team up with Swedish eclipse chaser Bengt Alfredson, to observe the eclipse from somewhere on the center-line north of Lusaka. On the flight from Johannesburg to Lusaka, I was sitting next to a German traveler. He hoped this would be his first clear eclipse having been clouded out in Germany in 1999. By the end of the flight Christian Fritzkowski had decided to join Bengt and I on eclipse day. Christian left Lusaka for Victoria falls on the 12th and didn't return to Lusaka until June 20th. Bengt was due to arrive from Sweden on June 19th. I offered to locate a car and driver and locate a suitable observing site for the group during my pre-eclipse activities in the village north of Lusaka and around Lusaka itself. The rest of this report covers two quite different aspects to the eclipse. There is an observer's report and a slide show of eclipse totality photographs. There is a report on what I've called the Kapini project, an eye damage prevention project that I undertook with my fellow observers in Kapini village. I realise that not all readers will be interested in both aspects so I've written two separate reports. To those of you that read both I apologise for any repetition. I've tried to minimise this while writing quite independent accounts. Text photographs and diagrams in this article are © Joseph A. Cali unless otherwise stated. 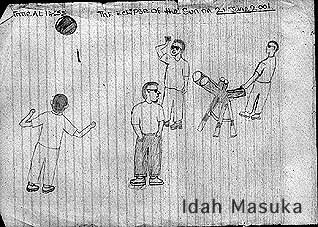 The impressions of eclipse day drawn by the year 7 children of Kapini Village(12 year olds.) Their names are printed on the drawings.